A thermometer is onne of the things that most paents can’t do without. The number of times that your child is not acting like themselves or just when they’re feeling a bit warm it is nice to have the reassurance from a thermometer that your child is just ‘ a bit warm ‘ or that they’re actually running temperature or compeletely feverish.The mercuri thermometer have long been replaced by digitals one. The ear digital thermometers particularly effective . Braun have long been in the market leader in the temperature measurement both in the home, clinic and hospital. The thermoscan range is much used and much love by both health professionals and general public a like. 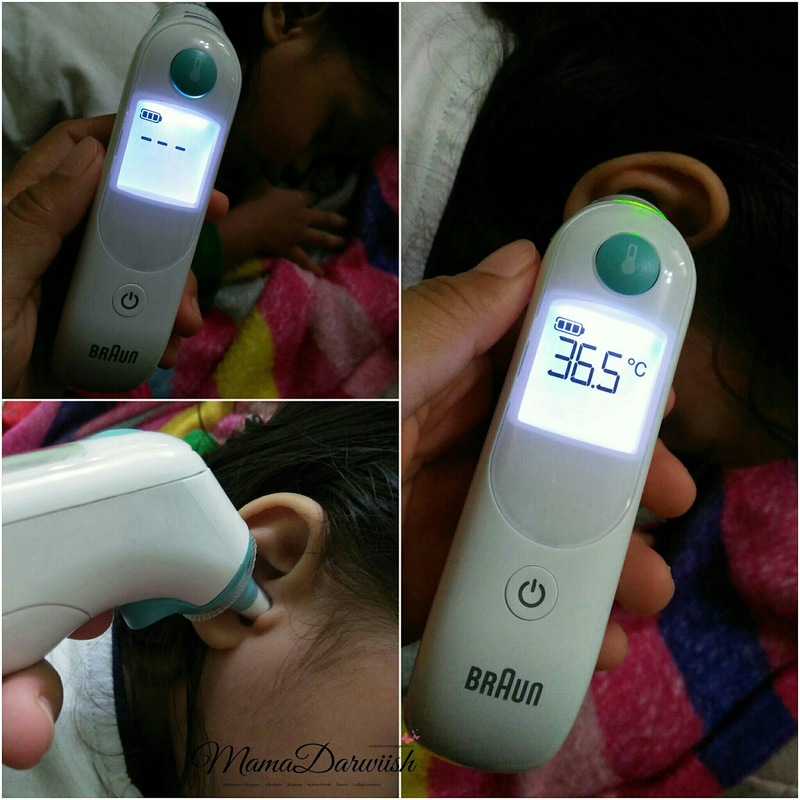 Braun have always been a brand I can trust and recently I was given the opportunity to review Braun’s new thermometer IRT6030 features with exclucive pre warmed tips technology to minimize the cooling effect of the tip inside the ear canal, providing accurate measurements time after time. 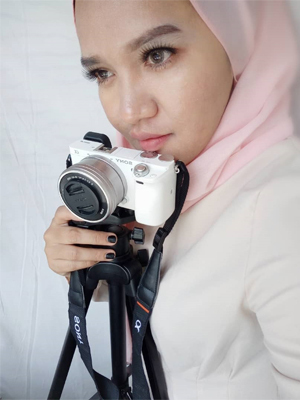 Its also pattern by ExacTemp technology uses a light and beep to confirm proper positioning and had night light feature and memory function , so its can be more easy to take a temperature even in the dark. 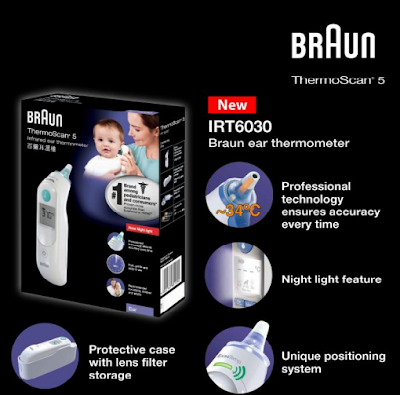 Braun New Thermometer IRT6030 contains the usual contents. A thermometer, Braun LF40 disposable lens filter ant manual. 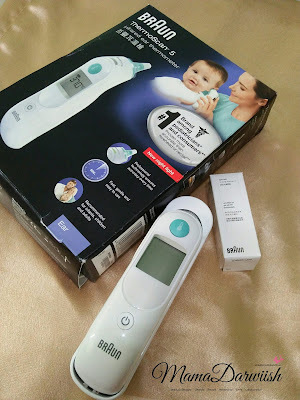 The thermometer comes with 2 AA batteries already installed. We just need to turn it on before use. Its compact compare to another brand because its comes with its own nifty protective case. 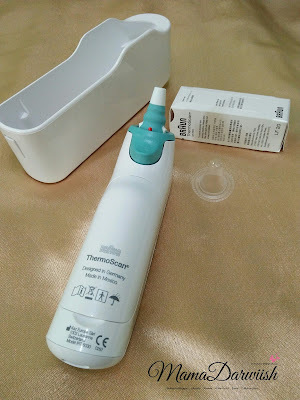 Notice the temperature measurement To use the thermometer, just put the lens filter over the tip. They are 21 in the pack and there very cheap tu buy and replacements. After that put the tip in our child ear and press the On and Start button to take the temperature measurement. A beep sound and the ligh flashes a few times when its has a reading. 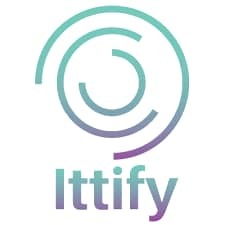 Make sure to replace disposable lens filter to maintain accuracy and hygiene. The right ear reading may be different from the raeding taken from the left ear. Therefore, make sure to take the temperature from the same ear. Having had the Thermoscan 5 had definitely put my mind at rest when cheching both kids temperatures. Its so easy to do and instantly let me know that their temperature is slightly raised and out comes. Ist great to know that I would have such speedy, accurate reading if their temperature was higher and its was something more serious. Braun disposable lens filters enable accurate and hygiene temperature taking. 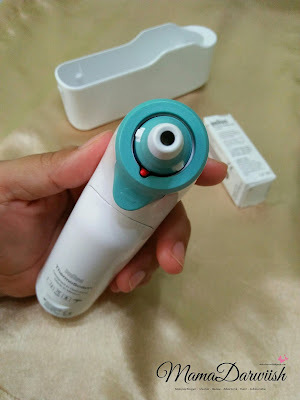 We must to replaced every time a reading is taken to ensure the hygiene without having to clean or disinfect the sens and to ensures that dirt or ear wax don’t buid up and clog the sensor window, which could lead to inaccurate temperature reading. Its designed to fit the Braun range and give total accuracy. Throw away the used lens filter after each measurement, just eject it by pressing on the button below the thermometer. Overall the Brauns new thermometer IRT6030 is amazingly easult this to use and gives us an instant , accurate reading. 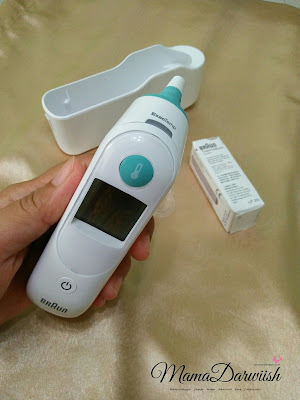 Braun Thermoscan thermometer are the thermometer brand among doctors, mothers in the world and their palce at the top of the difital thermometer market. I cant fault thi new thermometer IRT6030 and it woyuld definitely be my first choice if looking for a digital thermometer in the future. Don’t forget to Like clicks for Baunhealthcare Facebook to get more info and join the events and contest. 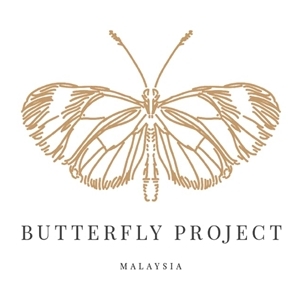 bagus ada satu kat rumah ni kan..
sng la klu de kat umah..